Anyone who liked watching batters club home runs undoubtedly enjoyed the doubleheader that the Braves played against the Pittsburgh Pirates on August 30, 1953, at Forbes Field. The Braves were in second place, trailing the Brooklyn Dodgers by 10½ games, as they prepared for this Sunday doubleheader against the last-place Pirates. Milwaukee fans, though, could rightly note that their team was playing some of its best baseball of the season. The Braves’ 21-9 record in August rivaled their May record of 19-8. They had won their last six games against the Pirates, who were mired in a seven-game losing skid. Since July 4, Pittsburgh was a woeful 14-42, dropping its overall record to 41-93, 50 games behind the Dodgers. The pitching in Pittsburgh had left much to be desired. The Pirates’ first-game starter, Johnny Lindell (5-15, 4.59)3, was a former outfielder who retired in 1950 after 10 seasons. (He also pitched 23 games for the Yankees in 1942.) Lindell worked his way back to the majors in 1953 as a knuckleball pitcher and was making his 24th start of the season. Milwaukee countered with Johnny Antonelli (10-9, 3.52). Things began innocently enough, with a scoreless first inning. The Braves seemed to miss a chance in the second inning, scoring only one run despite getting two walks and three singles, losing one runner at the plate and another caught stealing. Eddie Mathews hit the first home run of the afternoon in the third inning. It was the young slugger’s 26th homer on the road in 1953, breaking the record of 25 hit by Ralph Kiner for the Pirates in 1949.4 At home and the road, Mathews had 42 round-trippers, tops in the majors. The Pirates got on the scoreboard in their half of the inning, as Lindell singled home Mike Sandlock for the 400th RBI of his career,5 a nice 37th birthday present to himself. It proved to be Lindell’s last success as a Pirate, as he failed to retire another hitter on the mound, and would be sold to Philadelphia the next day (August 31). Jim Pendleton led off the Milwaukee fourth inning with his second home run of the season. Sid Gordon walked and Jack Dittmer smacked an RBI double, ending Lindell’s tenure in Pittsburgh. Manager Fred Haney had seen enough, summoning Bob Hall from the Pirates bullpen. By the fifth inning, the Braves had stretched their lead to 6-1. Then, they added a few more. First, Hall mishandled Antonelli’s sacrifice bunt. Hall retired Billy Bruton, but the extra out allowed Johnny Logan to come to the plate with two men on base and two men out. Logan launched his ninth home run of the season, extending the Braves’ lead to 9-1. Jim Waugh, who took the mound for the Pirates in the sixth, had already allowed 15 home runs in just 67 innings this season. It did not get better for the right-hander. With one out, Jim Pendleton and Del Crandall hit back-to-back homers. An inning later, Pendleton knocked his third homer of the afternoon, a three-run blast. 1. 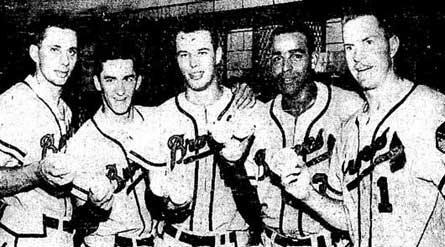 “Braves Belters Revise Record Book in Sabbath Circuit Spree,” The Sporting News, September 9, 1953: 15. 2. Willard Mullin,“Tularemia,” The Sporting News, September 9, 1953: 1. 3. Baseball-Reference.com lists Lindell’s ERA at 4.53 but only charged Lindell with seven of his eight runs allowed in St. Louis on July 29, 1953. Retrosheet.com properly charged Lindell with the eighth run, rather than his reliever Jim Waugh. 4. Red Thisted, “Braves Pop Their Muscles in Great Home Run Show,” The Sporting News, September 9, 1953: 7. 5. Lindell played 10 seasons (1941-1950) with the Yankees as an outfielder, finishing his career with 404 RBIs. 7. Jack Hernon, “Gopher Count up, Gate Dips in Smoky City,” The Sporting News, September 9, 1953: 8. 13. The Yankees hit eight home runs in a 23-2 win in the first game, and five home runs in a 10-0 win in the second game in a June 28, 1939, doubleheader in Philadelphia against the Athletics. http://www.retrosheet.org/boxesetc/1939/B06282PHA1939.htm.